Harvey Milk Day is an annual observance held on May 22. It honors the memory of Harvey Milk, an American politician and gay rights activist, who was assassinated in 1978. Harvey Milk was a member of the San Francisco Board of Supervisors. He won a seat in 1978, becoming the first openly gay candidate to be elected to public office in the state of California. While serving, he campaigned against the Briggs Initiative that would have banned gays and lesbians in working in public schools in California. On November 27, 1978 Harvey Milk and the mayor of San Francisco George Moscone were killed by Dan White, a former supervisor who wanted his resignation to be withdrawn. Milk had had several disagreements with White and had lobbied against his reappointment. Harvey Milk Day is held by the Harvey Milk Foundation. This organization focuses on encouraging organizations at all levels (local, regional, national, and global) to promote education that includes the story of Harvey Milk and the LGBT community and to support LGBT youth. 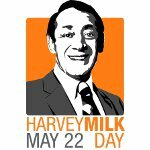 Harvey Milk Day is celebrated on Milk's birthday, May 22. It is considered a day of special significance for California's public schools. This day is observed by LGBTQ+ organizations across the United States and abroad.